The composition major is designed to welcome students who bring a range of musical backgrounds and experience to their creative work as makers of new music, whether one’s artistic influences and interests stem from classical, jazz, world, rock, popular, or other genres. Composition students have opportunities to compose works for various ensembles and to have their works rehearsed, performed publicly, and professionally recorded. 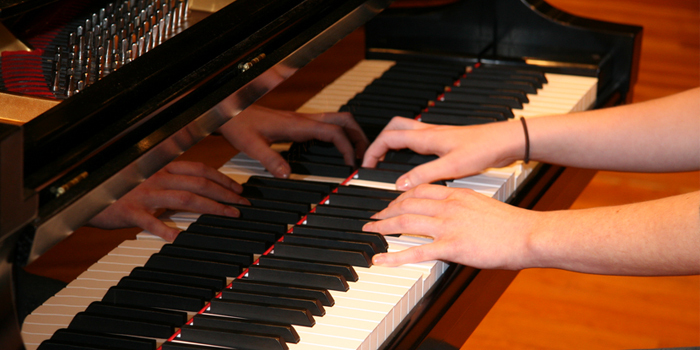 Students learn to trust their intuition, draw from the unknown, and apply structural and technical tools to realize highly personal, literate musical works. Composers at SDSU become adept at exploring and discussing the implicit aesthetic, cultural or technical issues embedded within their compositions and within the works of others. The undergraduate global composition degree curriculum includes significant coursework in electro-acoustic composition and students learn how to record, edit, and master recordings of musical compositions. The recording process is a means to another end, composing music, and students should understand that the degree is not an audio engineering program. We seek students with a creative spark, an original voice, a passion for music, and who are willing to work hard in developing their compositional skills.